When you were a kid, your house’s basement may have a been a dark and scary place where you didn’t dare venture unless you were with one of your parents. As you got older, you may have found the darkness and dinginess of the basement to be a bit more appealing, and you may have even moved your bedroom down there. Today, basements are much more than storage spaces and spots for the washer and dryer – they’ve been transformed into luxurious home theaters and living rooms, as well as spaces for guests to stay when they come to visit. If you’ve been thinking about updating your basement lighting, Hortons is here to help! Chances are that your bathroom has a lack of windows, and the ones it does have aren’t very large and may not let in much sunlight during the day. Since you’re likely to use your basement more during the evening, you’re going to need plenty of light. You don’t want to oversaturate the space, but having enough light will make the space more comfortable. If you want to emulate natural light, we can help you find the right color temperature for your bulbs. 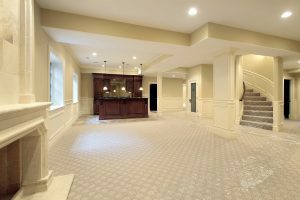 When thinking about new lighting for your basement, it’s important to know how you’re planning to use the space. Will it be a home theater area with a wet bar? Are you thinking about turning it into a man cave, complete with a poker table and pinball machines? Whatever your plan is, your lighting needs to fit it, and if you’re going to have multiple seating areas or lots of shelves, you’re going to need lighting for each space. Recessed and undercabinet lights are great for a bar area, and a pool table light is a must for the billiards area. Once you’ve chosen your new light fixtures, you’ll need to think about how you’re going to control each fixture. If you’re remodeling the basement, it can be easy to add new wiring for outlets and switches before you put up new drywall. If you’re going to have a home theater area, you’re going to need dimmer switches so that you can set the levels where you want them for optimal viewing. If the basement will have a hallway, you’ll want to be able to control the overhead lights from either end of the corridor. You’ll also want to have separate controls for each space, such as over the bar and above the seating area. Being able to control each zone will give you the option to leave some lights off when you’re playing video games or you and your friends are locked into an intense game of air hockey. If you’ve been thinking about updating your basement lighting, come to a Hortons showroom today to find the best options. We have locations in La Grange, Chicago, and Orland Park, and the staff at each store will be able to help you find the right fixtures and answer all of your lighting-related questions.